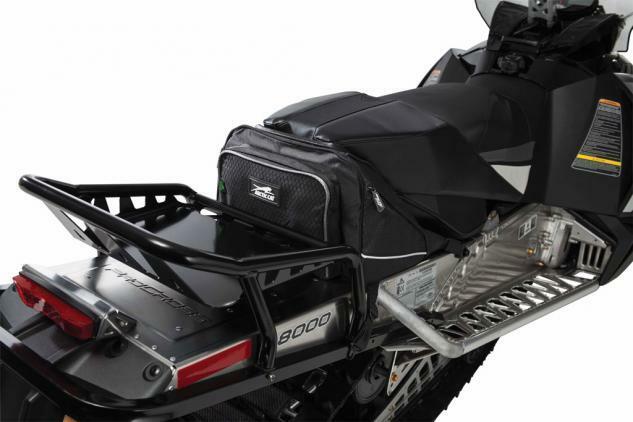 To get a sweet riding touring sled from Arctic Cat, you’ll need to spend more than US$12,000. The officially sanctioned top of the line touring Cat, the TZ1 LXR, comes with all the appropriate two-up appointments already configured. It carries two riders and a retail price tag of US$12,299. Powered by the holdover 1056cc Suzuki four-stroke twin, this 2014 model is built around the previous generation Twin Spar chassis. But, if you want a sweeter two-up touring sled, then think about building your own and basing it on the latest 2014 XF stretched chassis with smooth Yamaha power. Right now Arctic Cat does not “officially” offer an XF-based two-up touring sled, although the company strongly hints at one on its website and at snow shows. What Cat tends to imply is that you can start with an XF CrossTour and accessorize it to suit your riding style. Where the 2014 TZ1 LXR two-up comes with one engine option, you can specify one of three engines if you go with a base XF CrossTour and do-it-yourself. Here’s how we’d spec out our two-upper. To build your own XF-based two-up touring sled you’ll start with a basic XF CrossTour. There’s nothing wrong with the Twin Spar touring version. It’s very good at allowing you and a close friend to travel large amounts of miles in a single day’s ride. We simply prefer the enhanced handling and improved ride comfort of the new style chassis. 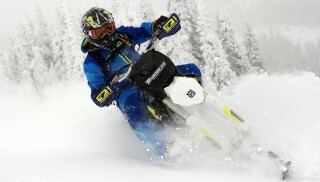 Plus, since we’d opt for the newly available Yamaha 1049cc triple, we’d get a more powerful and lighter weight sled. Let’s give Arctic Cat credit for fine-tuning its clutching to the Yamaha triple, which is a new engine to Cat. The drive systems in both the TZ1 two-up or our “designer” XF CrossTour work well, but we like the idea of the more sprightly feel of the 135 hp Yamaha. The 125 hp Suzuki twin just seems lazy by comparison. When you start by custom building an occasional two-up, you can retain as much of the basic dual purpose — groomed trail or off-trail — nature of the base XF, which means an ability to grab big air whenever you want. As we fill out our specification sheet for the CrossTour, we start with a suggested retail price of US$12,999, already US$700 more than the trail-ready TZ1. Where that sled comes with a two-up heated seat, backrest, adjustable handlebar and three storage bags, the build-it-yourself CrossTour requires a quick visit to the accessories catalog. To get two-up capability, you’ll need to add the optional 2-Up Seat Kit (US$550). Plus, you’ll want to add the passenger hand warmer kit option (US$90) and, perhaps, the CrossTour rear rack (US$130). That brings the custom-build touring sled up to US$13,769, or almost $1500 more than the TZ1 LXR. Is there enough added value? You’ll have to decide, but this upgraded XF 7000 CrossTour would be our choice. 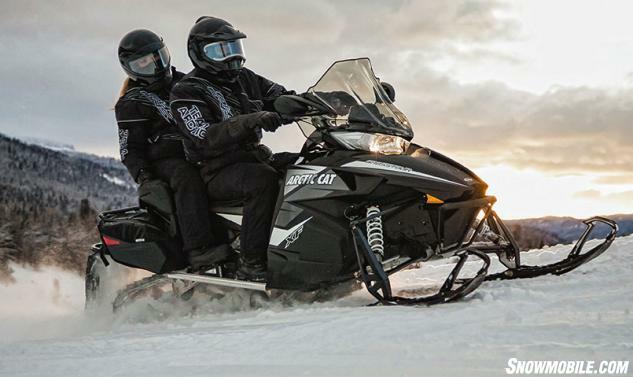 Cat’s TZ1 LXR, a pure two-up touring model, is based on the previous generation Twin Spar chassis and is specifically designed for extended groomed trail cruising. Its versatility ends there. As we stated, there is nothing wrong with the basic TZ1 LXR. It’s quite adept, but not very exciting. 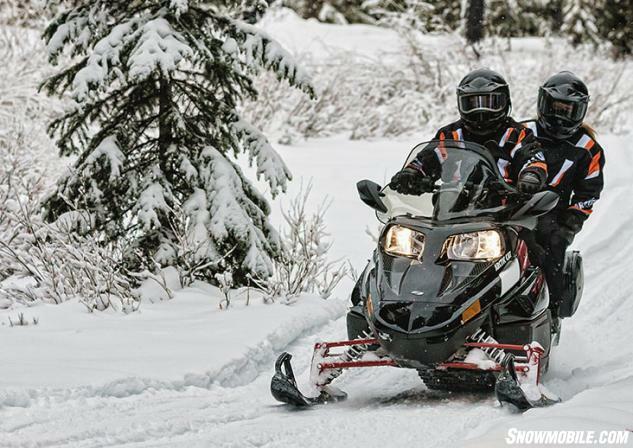 Plus, we offer this fact: touring sled sales are trending down while crossover models like the XF series are gaining sales. Also, when we hit the trails, we see very few touring models actually carrying two people. Our designer XF CrossTour allows us to bring a significant other along on an outing, but we can quickly remove the two-up kit and enjoy a rumble with the boys. While the touring concept exists, we suspect that outside of Quebec or among the AARP set, most riders – male or female – want their own ride. For that occasional two-up touring experience where you seek bonding with a partner or you need room for a youngster, we figure our designer CrossTour fills the bill just fine. Here’s what we especially like about the CrossTour versus the official touring model. First the CrossTour brings the latest Arctic Cat technology to the trail. And it’s pretty darn good. While the Twin Spar is okay, it never caught the fancy of Cat riders like the new XF design. The front end on the CrossTour with its tall spindle and mogul absorbing A-arm design gives you 10 inches of travel combined with exceptional cornering and ski bite. The rear of the 2014 XF CrossTour can be readily fitted with an optional passenger seat that fits in with the sled’s rear rack and accessory bags. The older Twin Spar design utilizes Cat’s Slide-Action slide rail rear suspension. We appreciate that the CrossTour comes with an inch more travel at 14.5 inches from the FasTrack design rear suspension. This parallel rail slide system is cleaner through off-trail powder and offers serious ride components like standard issue Fox FLOAT 2 shocks. Here again, by creating your two-up sled, you can get a more versatile ride from its XF underpinnings. Although the standard touring sled features a slightly longer 144-inch track versus the CrossTour’s 141-inch unit, the lug profiles seriously define your playtime. With a 1.0-inch lug height, the special purpose TZ1 needs to stay on groomed trails. Thanks to its 1.352 Cobra track, the CrossTour will be game for running unplowed forest roads or getting off trail in fresh snow. The Cobra track features a cupped pattern to grip loose snow for off-trail traction or braking. We think the deeper profile track blends in nicely with the Arctic Cat tuned Yamaha four-stroke drive system. We would opt for the Yamaha three-cylinder motor to power our custom XF CrossTour two-up package as it’s stone cold reliable, offers smooth drive-off and has plenty of low to mid-range grunt for long mile riding with a passenger. Let’s not pretend that these two sleds are complementary designs. No way! The Twin Spar TZ1 LXR is supposed to be Arctic Cat’s plushest riding, most two-up friendly sled the Minnesota-based company offers. The XF CrossTour differs substantially from the purpose-built touring sled and is a true crossover model in that it satisfies a trail rider’s need to go off the beaten-down snow trail when he spies an unmarked play field. The CrossTour is versatile. If you want more, there is always the option of equipping an XF CrossTour with more powerful engines – an 800cc Suzuki two-stroke twin rated at more than 160 hp or a 177 hp turbocharged version of the 1056cc Suzuki four-stroke twin. We recognize that most touring riders are actually serious about their need to be together and probably wouldn’t opt up for a do-it-yourself model. But, the day is coming that Arctic Cat will discontinue the Twin Spar models and create a new series of two-up touring designs that will be based on some version of the newest chassis and long travel Arctic Race Suspension. By necessity that sled will be more expensive than the 2014 TZ1 LXR and, most likely, bear some striking similarities to what we have spec’d out here for our designer touring sled. This Arctic Cat supplied image of a CrossTour with the optional passenger seat strongly hints as to the direction the company plans to go for future touring models. Maybe as soon as model year 2015? 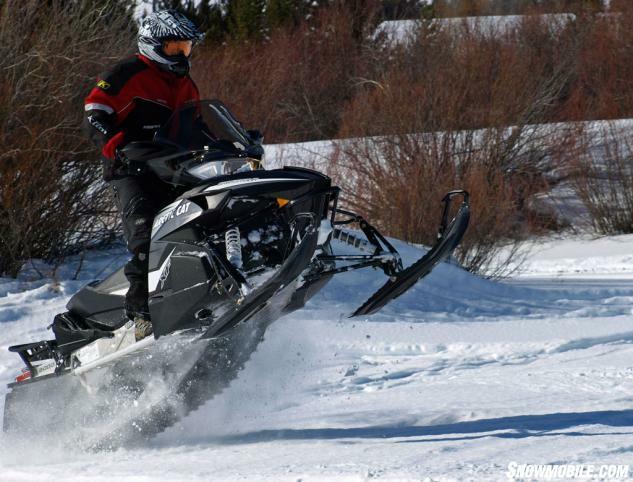 This is snowmobiling, not rocket science! Look at simple economics and you’ll see a need to simplify the manufacturing process, when you do that, you can see that the Twin Spar becomes history and the XF design is the now and future. The end result will be an occasional two-up long hauler that can double as a very much fun solo breakaway sled with many nice-to-have features like heated seating, mirrors, wind-beating windscreen, extra storage and a choice of power options from trail smooth to screaming hill climber. That’s how we figure Arctic Cat will go, now let’s wait to see if our designer touring sled built around the current CrossTour materializes for 2015. Don’t bet against it!